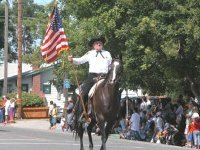 The Colusa County Sheriff's Mounted Posse is a group of civilian volunteers created to aid and promote the Colusa County sheriff's office. The posse is an equestrian mounted unit that augments the sheriff's regular deputies on details where a sworn officer is not needed. Members must be Colusa County citizens and at least 18 years of age. Potential members must submit an application, and a background check will be done prior to the sheriff's approval for membership. For more information or to obtain an application, please contact the sheriff's office at (530) 458-0200.